After a brief illness, Jesus has brought Choo Home. Choo passed away on April, 2013, to the place where she so desired to be. Choo Thomas tells a remarkable story of her encounters with Jesus Christ, where she visited heaven many times and saw hell twice. Her book, "Heaven is so Real" is more than just a book - it is Christ's loving message to a generation that has largely forgotten, misunderstood or is indifferent about Him. This book will touch your heart and soul and will challenge you to live a life of obedience and purity like you have never done before. Choo Thomas is a simple, down-to-earth Korean American. She is married and has two children and four grandchildren. In 1992, she accepted Jesus as her Lord and Savior and since then, has strived to please the Lord with all her heart. Two years later, she saw Jesus' visible presence at a Neighborhood Assembly of God in Tacoma, Washington and in 1995, she began having physical manifestations from the Holy Spirit. In 1996, the Lord Jesus escorted Choo into heaven and told her to record what she has seen and heard, bringing forth the book, "Heaven is so Real". This book was published in October, 2003. ChooThomas.ORG IS the Official Website of Choo Thomas / Heaven is so real. But The website ChooThomas.COM is NOT official, but has been taken down by the web-technician without Choo's approval. 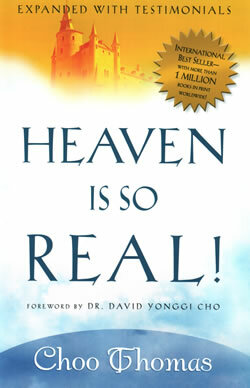 A Message From Choo Thomas Regarding "Heaven is so Real"
Heaven is so Real is our Lord Jesus’ end time book. He only used my body to write this book. He wants all believers and unbelievers to read it and prepare for His coming. He said, He is letting people know what it takes to enter His Kingdom, through this book. Remember, none of our salvations are secure until the end. We work out our salvation with fear and trembling (Philippians 2:12). The Lord himself took me to heaven 17 different times, in my transformed spirit body, at an age of about 15 to 16 years old and showed me countless things in heaven that He has prepared for His people, and showed me hell twice. He also showed me things during the time of the tribulation, after He took His people to heaven. After the end of all these visions, He showed me the rapture. The preface clearly explains how the Lord took me to heaven. When you read this book you will see how the Lord took care of this book from the beginning to end of publishing. This book is a great tool for the salvation of souls. Those who read this book and convicted by it, are sharing it with others. Some get dozens, hundreds, and thousands to give away.The book is our Lord Jesus’ end time book and He wants all Christians to read it and witness with it to others so they can prepare for His coming. It is changing thousands of lives. This book is for two kinds of people, those who want to go to heaven and those who love the world. So, not everyone will be interested in His book. The devil hates this book. Currently over 60 countries are translating and re-printing this book and most of the translations are being done by pastors who were transformed by the book after reading it. Dr. David Yonggi Cho translated the book after reading it three times and it was the #1 bestseller in Korea. All these things are happening because it is our Lord’s book. It is truly an end time book. The book is an International best seller and is on the charismatic best seller list in the US. It has been almost four years since it was published. I would like to let all the readers of the book know what our awesome God is doing for His people. Praise the Lord!! He has moved some reader’s hearts to make donations toward His book. He brought in close to $300,000 in offerings and the money has been donated to overseas pastors who translated the book but don’t have enough funds to print the book and give it away. With this money they are able to print the book and give them away. Over 100,000 books have been printed in China and Muslim countries. Pakistan has printed 50,000 books. India, Africa, and many other countries in Europe have printed and given the book away freely to prisoners and some poor countries. All these awesome things are happening because it is His book. Hallelujah!! Some readers are curious how much money we make from the sales of the book and what we do with it. The royalties that are received from Creation House are spending on our ministry. We are donating money to many poor countries for the books and sending out DVDs/CDs all over the world for about three years now. We are sending out at least 30 packages weekly. We decided never to spend any money from the royalties or offerings for ourselves. Whoever judges “Heaven is so Real” and other prophetic books should read Matthew 7:1-6, repent and stay ready for the rapture before it's too late. Christians should never judge other Christian's work of God. Remember any kind of message from God that doesn’t bear fruit is not from God. “Heaven is so Real” is bearing more fruit than most prophetic books around the world. The Lord has been saying that because of this book, at least 1,000,000 people will see His face. I am praying for those who will be left behind after the rapture, to read this book, so they can be saved also. Please go to: www.ChooThomas.org. This site has some awesome testimonies in English and Korean and also links to some CD samples of the book. My video is on the internet. The link to the video is on my homepage. The DVD is about forty minutes. Please witness with it. Praise the Lord!!! The Lord Jesus loves us all.